Sudip Chatterjee is leading the Global Capital Markets business at Euroclear. Mr. Chatterjee is responsible for defining and designing the vision and strategy, along with aligning all business initiatives across the global capital markets business line of Euroclear. In this capacity, Mr. Chatterjee leads the discussions with market authorities and regulators in local and international markets across the world, with the objective of implementing solutions that help market liquidity resulting in a stronger macroeconomic climate. Mr. Chatterjee has constant dialogue with multilateral financial institutions trying to find ways of creating sustainable social development through capital market development. He also maintains relationships with other key capital market entities, including rating agencies, index providers and the leading global fund and asset managers, to ensure alignment and facilitate the growth of the capital markets globally. 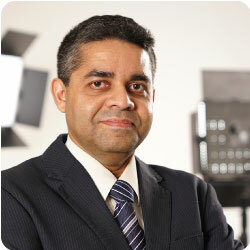 Prior to his current role, Mr Chatterjee held a number of senior positions within Euroclear, including Product development, Network Management and Change Management. Prior to joining Euroclear, Mr. Chatterjee was a management consultant, advising various organisations, such as Bank of America, Axa and Eurocontrol. Mr. Chatterjee has a bachelor degree in Civil Engineering and a post-graduation in Management from India.